Mark's Lock and Safe Ltd. Serving Guelph , Wellington County and surrounding area. Business Hours: Monday - Friday 8am-5pm. After hours appointments available upon request. your safe as cleanly as possible. There are certain industry standards that must be followed when changing a safe combination. 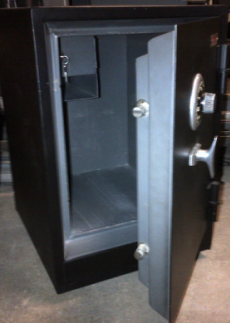 A safe professional will ensure that the change is done correctly..
We offer new and used safes for sale.. Used safes are dependent on availability. See our safe sales page for more information. We cut many types of keys such as house, office, motorcycle, atv, safe, high security keys and many more. If you are moving to a new home or own a business, Having your locks rekeyed will give you peace of mind. You will know exactly who has keys to your property. that big ring of keys. We service heavy duty and custom security equipment. Safe deposit boxes, anti hold up units, night depositories, Atms and timelocks. Aluminum glass doors are popular and have their own specific hardware specifications. Paddles, levers, latches, mortise cylinders and latch guard plates just to mention a few. Suddenly it becomes an issue to be able to secure documents, medications or personal items. We can put a lock on it.